Obviously there is a temperature range within which the plants can optimally grow and reproduce. Growth and reproduction are less efficient at temperatures above this range. Above a certain temperature, the plants cannot reproduce. The most critical responses are that crops develop more quickly under warmer temperatures, leading to shorter growing periods and lower yields, and that higher temperatures drive faster evaporation of water from soils and transpiration of water from crops. Many important grain crops tend to have lower yields when summer temperatures increase, primarily because heat accelerates the plant’’s developmental cycle and reduces the duration of the grain-filling period (CCSP, 2008a; Rosenzweig and Hillel, 1998). Exposure to extremely high temperatures (e.g., > 35C) can also cause damage in photosynthetic, reproductive, and other cells, and recent evidence suggests that even short exposures to high temperatures can be crucial for final yield (Schlenker and Roberts, 2009; Wassmann et al., 2009). 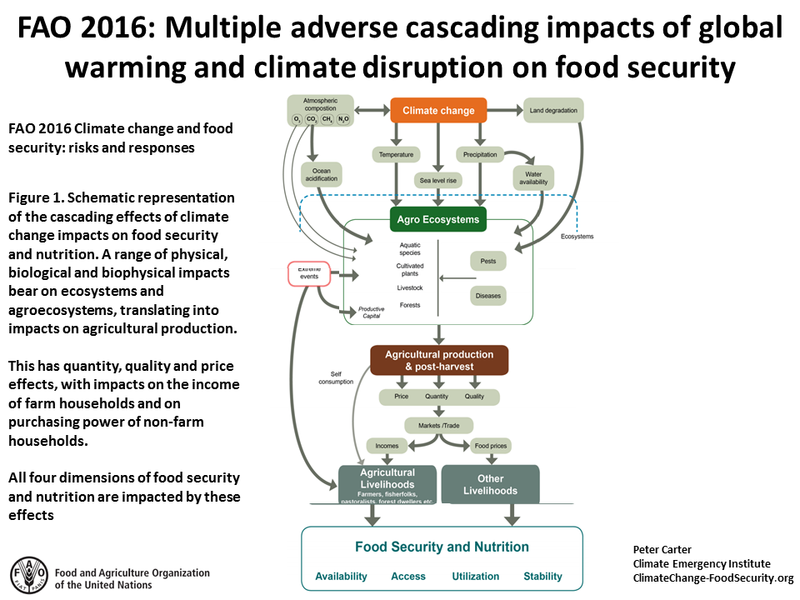 The commitment of increased climate change and increased damages to crops. For food security for humanity (all future generations) there is another huge problem arising from the models and how their results are applied. That problem is the lag effect of an increase in the atmospheric GHGs concentration and the full amount of global temperature increase caused by it. This fundamental aspect of the climate science is not accounted for in policy considerations for estimating climate change danger. At any particular time, in the situation of continuing greenhouse gas emissions, the global average temperature increase does not fully reflect the increased atmospheric GHG concentration at that time. The full amount of global temperature increase 'commitment' is double the temperature increase at that point in time. That committed additional global warming takes place over hundreds of years. Food production is both a victim of global climate change and a cause by being a source of all three main GHGs. 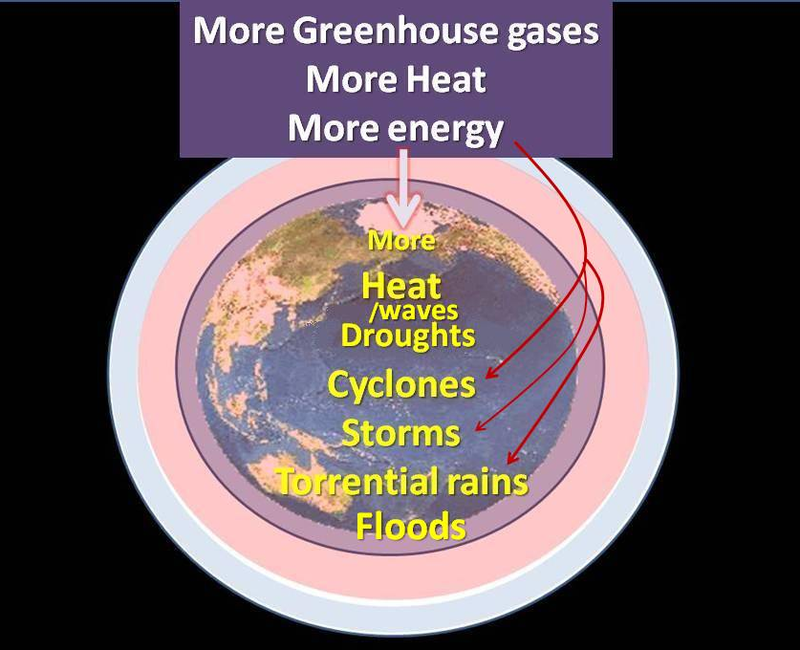 The more greenhouse gases (GHGs) there are in the atmosphere, the more heat is trapped in the lower atmosphere heating the surface of our planet. 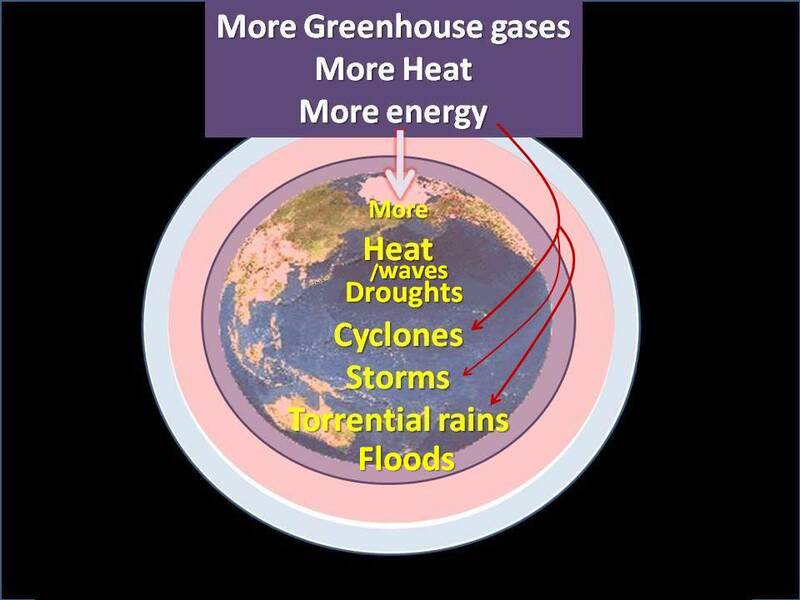 More heat means more water vapour - a greenhouse gas. This means the hotter it is, the more water vapour is generated and that translates into more heat waves and droughts. It also means more rain, heavier rain and more floods. More heat means more energy that energizes the planet's water cycle - so more torrential rains, severe storms, and cyclones. Too much water is as bad for agriculture as too little and under global climate change we get more of both. Most of the extra rain gets driven to the far north and south. More will fall over the oceans, so all in all agriculture suffers. ​Carbon dioxide, unlike the other global warming greenhouse gases, potentially has a beneficial effect for plant growth. Plants utilize the carbon dioxide in the air together with sunlight to manufacture their energy (photosynthesis). Potentially, there is this so-called carbon dioxide 'fertilization' effect from increasing the ambient carbon dioxide. Under a situation of uncontrolled greenhouse gas pollution and global warming, which is our current situation, any potential effect from carbon dioxide fertilization will at best be modest and short lived, as the IPCC says. 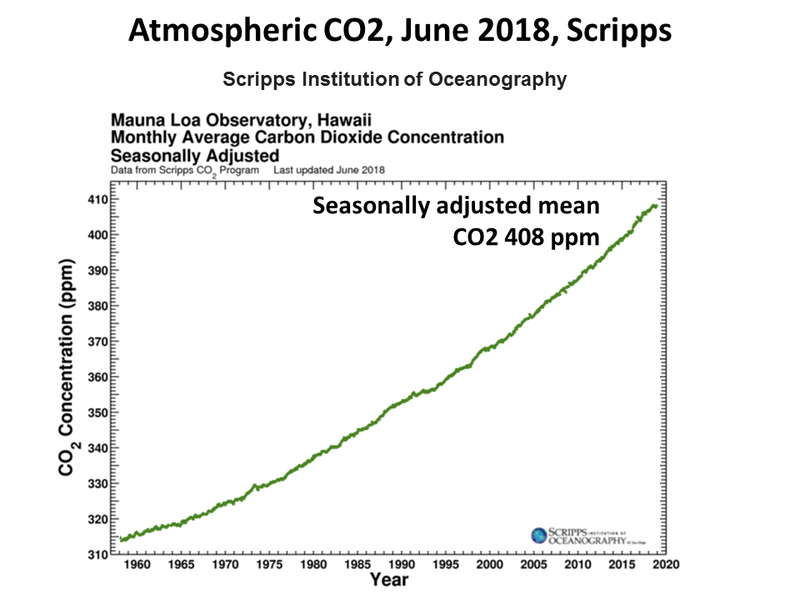 It will inevitably be overwhelmed by all the adverse effects on plant reproduction and growth as the world becomes warmer caused mainly by the carbon dioxide increase (along with the increase in the other GHGs). sea level rise - salt affecting good agricultural soils far inland. 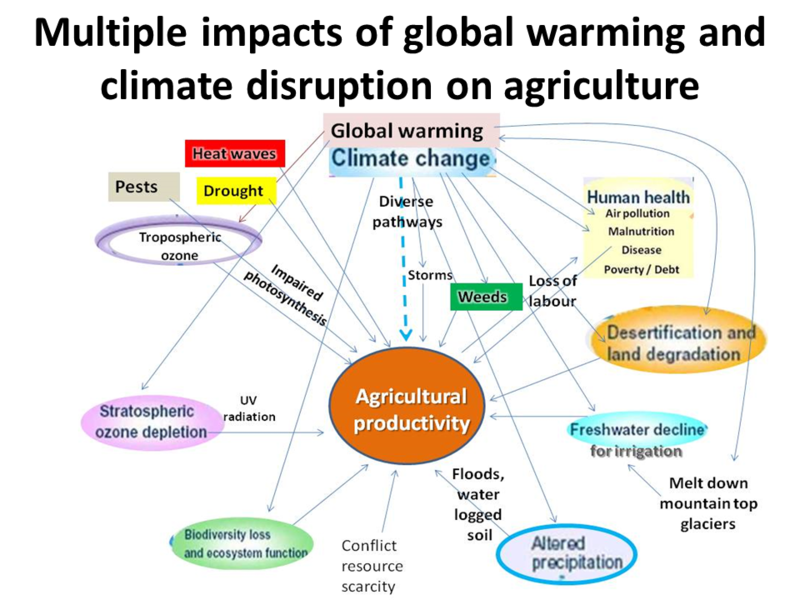 The chart opposite lists the important known effects of global warming climate change on agricultural food production, both positive and negative. 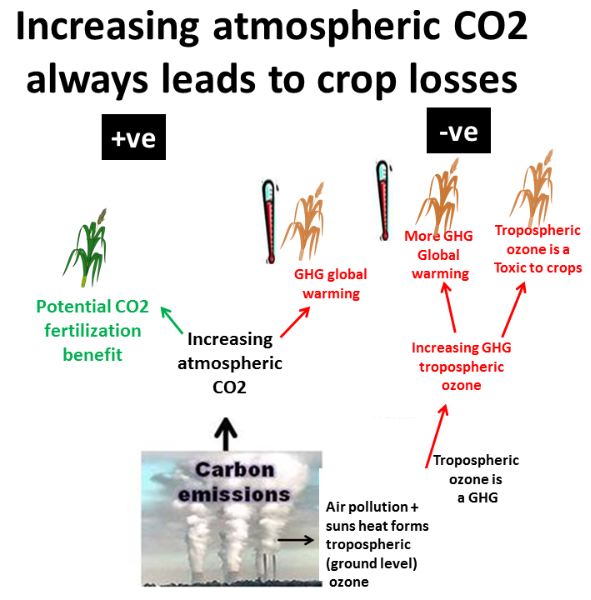 Increasing the CO2 in the air potentially has a beneficial fertilizer effect on crops. Tropospheric (or ground level ozone) is increased with increasing temperatures and is toxic to green plants. 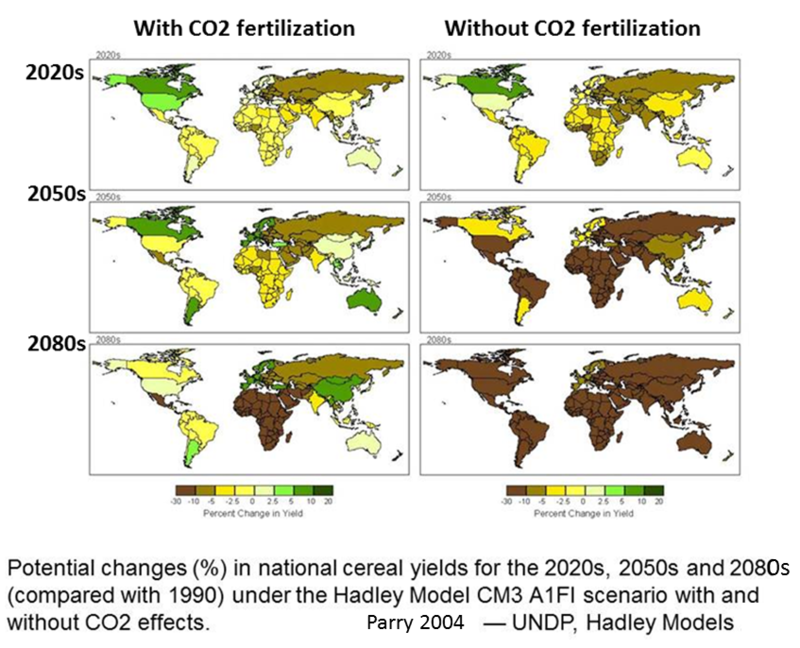 The crosses indicate the impacts that are not included or poorly represented in the climate crop computer models (according to the IPCC). 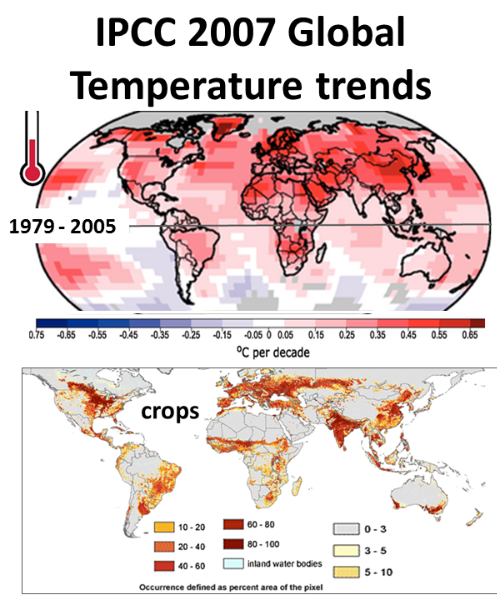 The IPCC assessments provide policy makers with a very limited number of the adverse effects of global temperature increases and climate changes on crop yields in different parts of the world. These are on very limited number of crops- just a few cereal crops. 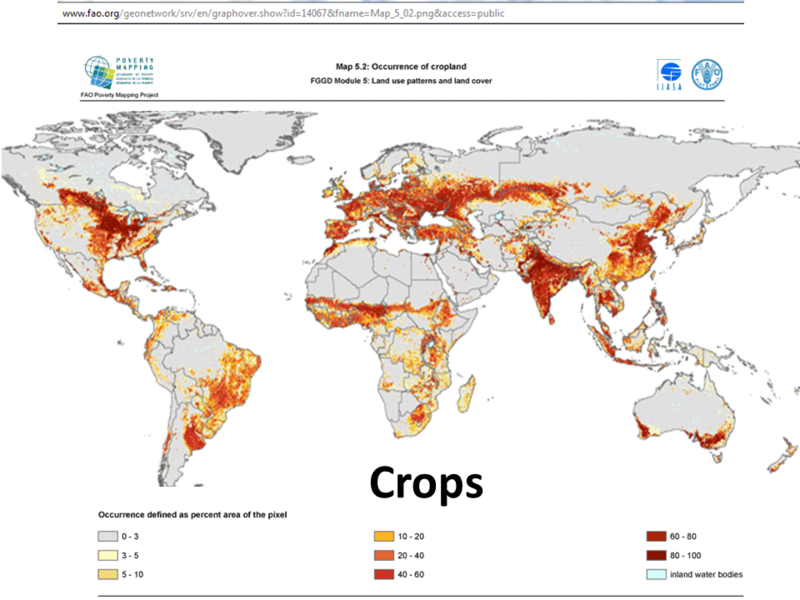 Little research has been done on the crops in the most vulnerable regions. 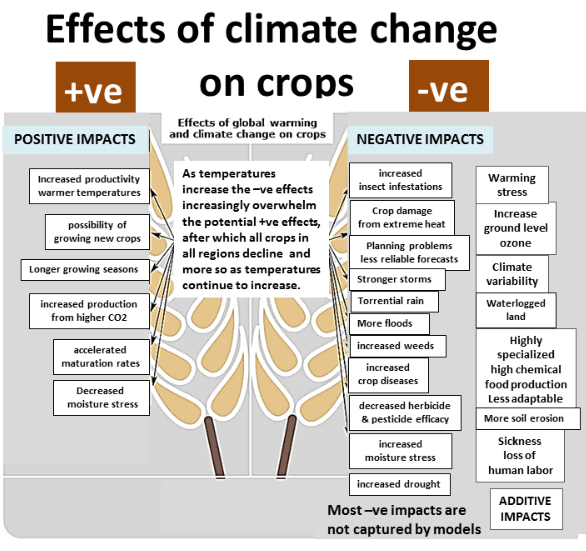 Due to the number of highly significant inevitable adverse impacts which are not or inadequately included in the climate crop models, the assessment results given by the scientists should be assumed to be large under estimates. The expected impacts are useful as a measure of the likely direction and magnitude of average yield changes, but fall short of a complete risk analysis which would, for instance, estimate the chance of exceeding critical thresholds. Extreme weather events are already increasing due to global warming (IPCC 2007) and will increase further (IPCC special report 2012)..
​However, the climate change assessment models do not capture the real impact of extreme weather events and so they are not accounted for in the climate crop yield production changes of the IPCC assessment. Climate change caused increase in extreme weather events has already started and at today's at 0.8C increase in the global temperature. The temperature increase commitment commits us in a few decades to damaging impacts to agriculture in all regions. Extreme weather events increase with global temperature increase - in all regions. The 'burning embers' illustration is how the scientists expect extreme weather events to increase. Today's global average temperature increase is O.8° C.
Today's absolute temperature increase commitment is 1.6° C due to the heat lag from the oceans. 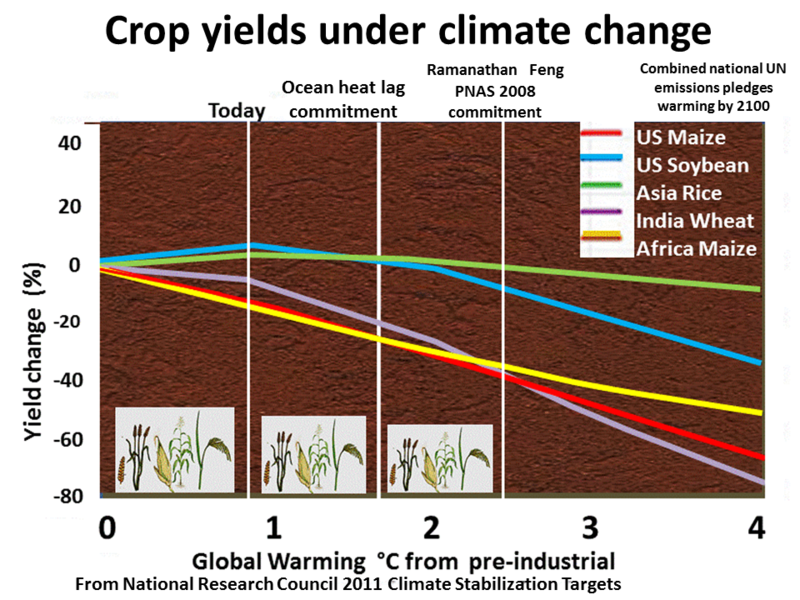 The illustration opposite shows this situation of climate change commitment to reductions of crop yields. Most scientists say we already committed to an increase of above 2°C. 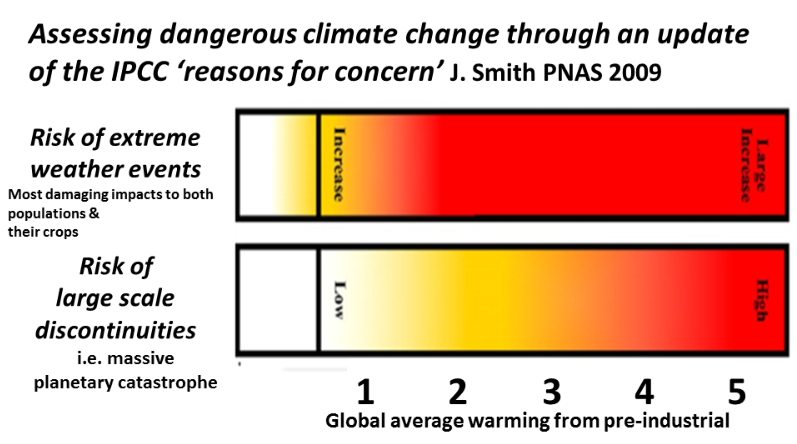 Recent publisihed science puts our commitment today as high as 2.4° C (Ramanthan, Feng PNAS 2008). So if a policy maker wanted to avoid exposing all the agriculture of future generations to a global average temperature increase of 2°C (for example), calculating this from the climate crop model results for 2°C will not work for the food security of all future generations. The policy will have to be based on preventing a temperature increase of 1.0°C. This is not being considered. Many of these harmful effects will impact on a local or regional crop all together at various times. Many of them make crops more vulnerable to diseases. Increasing extreme weather events from global warming and climate change are particularly difficult to predict by modelling and particularly damaging. In the real world the end result of all the combined and cumulative combination of all the impacts cannot be modelled and is being ignored. 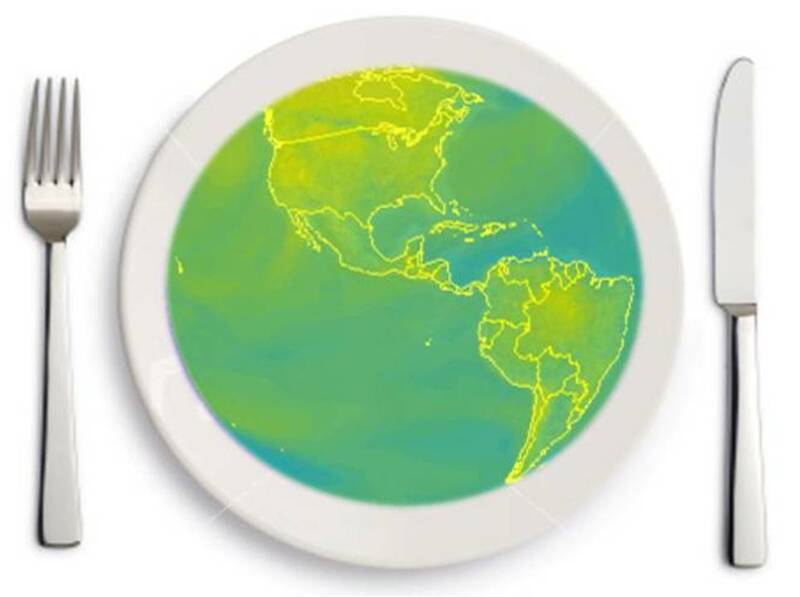 The science of the effect of global climate change on food is based on climate crop model results. Only the main cereal crops have been included in assessments​. ​In June 2018 the research on Effect of environmental changes on vegetable and legume yields and nutritional quality, was published, which points to a large negative impact from combined climate change effects. ​​The science of risk and risk assessment should be applied to climate change and food security. 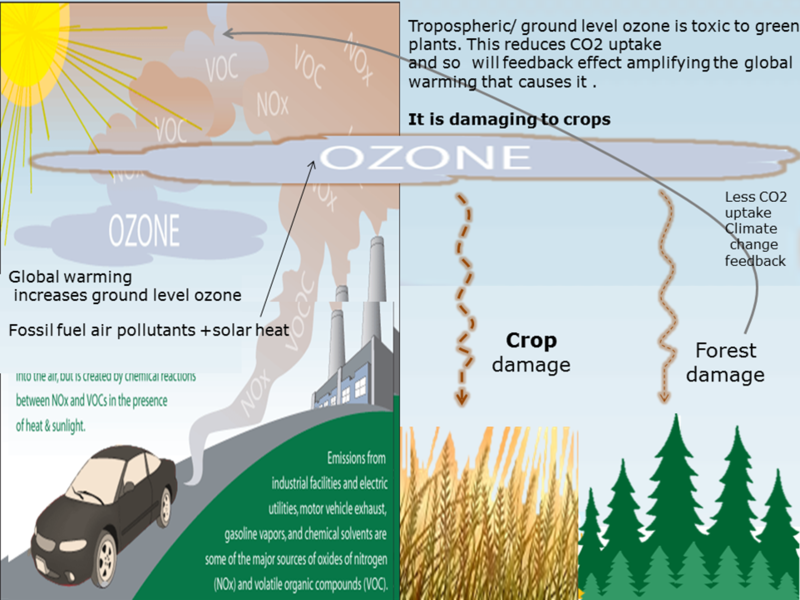 ​Ground level ozone increases with global warming is toxic to green plants inhibiting photosynthesis. Research has indicated that this effect could be very large as temperatures increase, but it is not captured in the climate crop models. Policy makers use the climate crop model results of the last assessment of the Intergovernmental Panel on Climate Change (IPCC) for expected climate change impacts,though they are clearly ignoring them). For food security this 2007 assessment is out of date, being based on science up to January 2006. Another 2007 assessment on the topic is by agricultural economist Bill Cline Global Warming and Agriculture Estimates by Country (see Cline). A more up-to-date assessment is provided by the National Research Council's (NRC) 2010 Climate Stabilisation Targets. ​and central continents. Global warming is faster in the N hemisphere than the south about double now. Warming is faster in central continents regions- about double with more global warming.